Slowly but surely, bits and pieces of our home are really coming together. I'm particularly excited about our guest bedroom, as it was the catch-all for unpacked boxes, furniture and other things we didn't have space for during our messy renovations. For several months it was hard to even walk around in the room, and it is finally the serene, cozy place I had dreamed about. 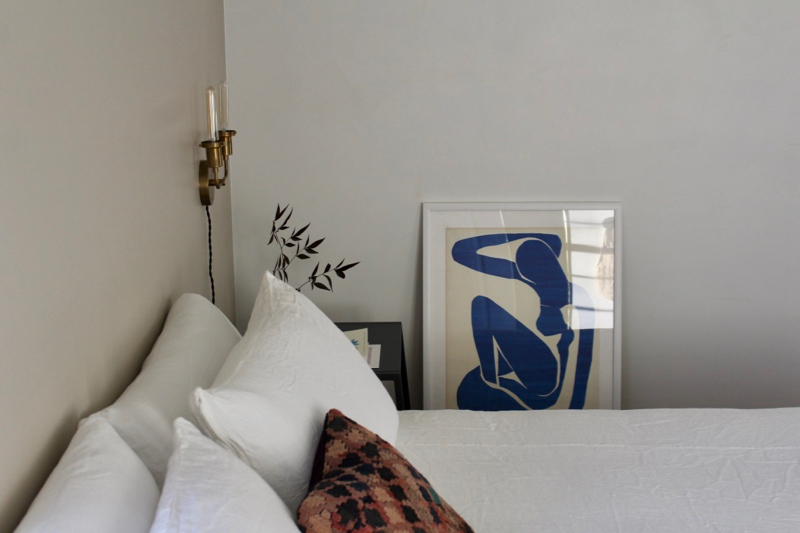 I have a soft spot for rumpled linen, and this crisp bedding from Rough Linen is magical. It is strong and durable with a soft texture and precise seaming. I love linen for its ease, and prefer to leave my bedding more wrinkled for a lived-in look and feel. I chose the Orkney duvet cover in white, with matching king size pillow shams. The invisible zippers keep things minimal. The Antelopes Poster is by Debbie Carlos, and we had it framed from Simply Framed. I highly recommend their site for affordable, easy custom framing needs. The moody colors of this print really pop against the white wooden frame. I rotate out fresh flowers, branches and leaves on the antique dresser, and recently plucked some dried hydrangeas from our yard. The lighting is from Schoolhouse Electric, and I prefer to have everything warm and glowy on dimmers. The metal nightstand is from CB2 and the rug is a vintage score from EBTH. Some favorite books, artwork, knick-knacks and items we've collected from our travels really complete the space.